Most people use power tools for various projects nut there are some jobs that require the use of hand saws due to the necessity for more precision. There are many different kinds of hand saws on the market, each designed for specific tasks. The best hand saw is made from durable, heavy duty carbon steel and while it has a little bit of give to it,it is not flimsy when you are using it. They will also have hardened teeth that stay sharp longer than standard saw teeth. Our pick, the Stanley 20-045 15-Inch Fat Max Hand Saw, is a 15” handsaw with an attitude. Hand saws don’t have to be difficult to use, especially if you take the time to match the hand saw to the job you are doing. The purpose of this guide is to help you identify the different hand saws and match your project with the right hand saw for your needs. When most people think of hand saws they think of the style that looks like a wedge with a handle at the wider end and teeth down one side. Hand saws are used often in woodworking projects where the user wants to have more control over what they are cutting. A well maintained hand saw can be enjoyable to use when you are using it for the right applications. Take a look at the three top rated hand saws we have reviewed here and read the buyer’s guide so you will be equipped with the knowledge you need to make the right choice for your needs and wants. IRIN is a well known brand of high quality power tools but their hand tools are just as high quality and popular with woodworkers and others who regularly use them. This handsaw has a tapered nose that helps with clearance and stability. The comfort grip provides a lot less hand fatigue due to the ergonomic shape that makes. This grip is made from molded resin and makes the saw much easier to use. The triple ground teeth cut up to 3 times faster than regular, standard hand saws. It also has a universal tooth grind that removes material from the teeth effortlessly. The design of the handle and thickness of the blade help minimize binding and allows the user to deliver full strokes for the most efficient cuts. Another feature of this high quality hand saw is the water-based lacquer that coats the blade and improves speed and control. The quality of this tool makes it the only handsaw you will really ever need. 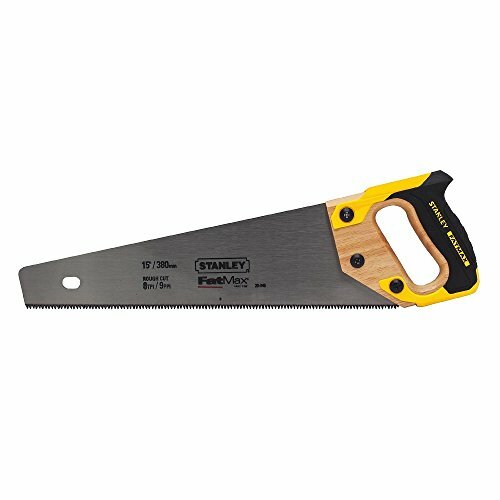 Another gem in the Stanley hand saw lineup is this 26” shortcut saw. 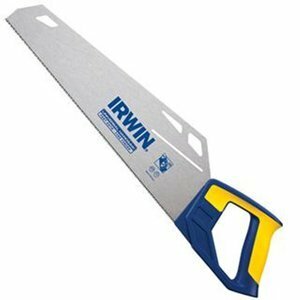 It has 12 points per inch and is the perfect saw for cutting laminate, all types of wood, plastic pipe and more. The induction-hardened teeth will stay razor sharp three to five times longer than regular saw teeth do. Each tooth is three sided, providing a very aggressive cutting surface that cuts through a number of materials with little effort. The SharpTooth technology is used in this great saw as well and provides 50% faster cutting than standard handsaws. The large hardwood handle adds plenty of user comfort while using the tool and makes it easier to grip even if the user is wearing gloves thanks to the large opening in the handle. It comes with an impressive limited lifetime warranty. This powerhouse of a hand saw is definitely one you want to have in your tool collection. The 15” fat max saw blade is designed with induction hardened teeth that stay sharp as much as 5 times longer than regular hand saws. The handle features an ergonomic design and comfortable, non-slip grip that makes it easy to use. The saw blade on this Stanley saw is 15% thicker than other blades which makes it resistant to binding and provides straighter cuts too. The back of the Fat Max saw can be used to mark 90 degree and 45 degree angles so you can measure your work faster and more efficiently. It comes with a limited lifetime guarantee and is the perfect choice for cutting most kinds of wood and plastic too. Hand saws are operated by hand without the use or necessity of electricity or batteries of any kind. All you need is a strong arm and shoulder and you are all set. There are several different kinds of saws on the market that you use by hand. What determines which is best for you is the types of projects you have to cut, the frequency in which you will be using the saw and other factors as well. Knowing the determining factors before you purchase a hand saw will help you choose the right one that meets your needs and preferences as well. The three top rated choices we have reviewed above are all classic hand saws. This type of hand saw is one of the most commonly used in wood working and other applications. All three of these are from highly respected names in the tool industry and are suited for cutting any type of wood and many plastics or laminates as well. There are many different types of manual saws that don’t require anything but hand power. We have listed them below with some characteristics of each of them so you can identify the kind of manual saw you want for your projects. Handsaws – This is the most recognized and used type of manual saw. The hand saw is used most often for cutting panel materials, long boards, short boards and can even be used to cut down trees and trim branches. The best hand saws are the ones that have thicker blades which discourages binding, and that have hardened teeth for improved cutting speed and precision. Some hand saws have blades that are designed for rip cutting or cross cutting and some can do both. The handle has a D shaped hole in it for your hand. It provides users with the most control over the saw. Look for large D cutouts that can accommodate larger hands and comfort grips for less hand fatigue. Dovetail Saw – The dovetail saw is a fine toothed saw that is similar to the tenon saw. It is best suited for cutting dovetails. It features a thin blade that has a spine which will add weight to the saw. This extra weight keeps the blade in tension while you are in the middle of cutting. It is not the saw to use for deep cuts since the spine of the saw prevents depth. Most dovetail saws on the market have a D shaped handle and minimal set of teeth for making a very thin kerf. Gents Saw – This hobbyists saw got its name from the gentleman who used to use them often in the 19th century. They have a super thin blade and 20 teeth per inch that are perfect for making miniature furniture and models. It is also well suited for making instruments. The handle of the Gents Saw is straight and not in a D shape and the blade has a spine for added support and tension. Razor Saw – Razor saws are another type of saw that has a ton of teeth per inch. This one features 40 per inch and is perfect for making models and tiny furniture where finish is an important thing. The shape of the teeth on the razor saw is designed for cross cutting. It is similar to the Gent’s Saw and has a reinforcing spine as well as a straight handle. The blade of the Razor saw is shallower than the others. Compass Saw – Another name for a compass saw is the keyhole saw. This type of manual saw features a long and narrow blade that is perfect for cutting curves, very tight radiuses and shapes as well. It is most like the jigsaw in function without the electricity. If you are working with drywall or another type of thin material, you will appreciate having a keyhole saw. Hacksaw – The hacksaw is another very popular saw that is used for a multitude of tasks including cutting all types of wood, plastic and metal too. The hacksaw has a frame with a built-in handle that keeps the blade in tension during the cutting process. The blade of the hacksaw is very thin and can be mounted to either be push or pull stroked. The height of the hacksaw’s frame determines how deep the saw will be able to cut. Coping Saw – The thin disposable blade of the coping saw is much like that of the Hacksaw. The blade is very narrow and is suited for cutting curves, cutouts, and other intricate shapes. You can also set coping saw blades at an angle to the frame of the saw to allow it to cut those shapes and curves much easier. Ryoba Saw – The word Ryoba means double blade which is how this saw got its name. It has double sided blades that feature rip cutting teeth on one sit and cross cutting teeth on the other. This makes this type of saw a two-in-one saw. The handle of the Ryoba saw is straight and wooden and wrapped in rattan. This Japanese style saw blade is much thinner. Back Saw – Back saws are very similar to what is called a carpenter’s saw. They are shorter and have a top edge that has been reinforced which reduces flexing. The spine has just the right amount of weight to apply even pressure on the fine toothed blade. The blade of the back saw is thinner than some other types. This saw works well with a miter box and is good for creating dovetails and tenons. There are basically two parts to the hand saw, the handle and the blade. But other areas of the saw have names as well that we will share with you. Aside from the handle and the blade, there is an area that is below the handle and features a 90 degree angle of the back of the saw blade. This is known as the heel of the saw. The opposite end, where the blade of the saw tapers down to a small part is called the toe of the saw. There is also the gullet which is a little ways back from the toe. The jagged points are known as teeth. There is a place for at least one good quality hand saw in your tool box but if you engage in many of the activities that involve using a manual saw on a regular basis you will want to consider choosing a couple of different kinds of manual saws such as a hand saw, hack saw and one or two others. Doing this ensures that you will have all manual sawing tasks covered. The information in this guide has provided you with the different types of saws and what they are best suited for. This enables you to look at the projects and tasks you do and match them with the right saw for the job. With the right knowledge you will be able to sort through the different saws and come up with the one that is perfect for your needs.